Airwolf 3D Printer Review - Does the Airwolf have the Chops? Airwolf 3D HD Printer Review – Does the Airwolf have the Chops? When you think of major 3D printing companies I am sure the top few things that come to mind are probably Makerbot, Ultimaker and Reprap. Though these guys have done their fair share of innovating and making quality products they draw the spotlight away from lesser known brands that have just as compelling options regardless of their lack of recognition. One such company is Airwolf 3D with their line of printers, though they are pretty similar in design each offers their own benefits over one another and today we’ll be talking about the Airwolf 3D HD. Airwolf seems to have poised this printer in line with the Makerbot’s Replicator though with many improvements over this competition. Would I Pay Full Price for The Airwolf? The Airwolf 3D HD boasts a staggering array of 15+ materials supported officially, even though many of them are fairly similar. this is possible due in part to it’s open sourced software and range of temperature both the extruder and the heated platform can reach. Airwolf was founded by Erick Wolf , along with his wife, whose previous career led him to become a patent attorney after going to school for a Mechanical Engineering degree. He started experimenting with 3D printing in late 2011. Frustrated with his inability to get a printer he purchased to print many of it’s own parts to replicate itself, he scrapped it and by late 2012 he had made his own design based off of the pre existing platforms of Prusa Mendel and Mecano Air, hence the name Airwolf. The simple goal of printing a model sports car lead into the development of several iterations of this new printer before Wolf started marketing and selling them from his garage. In a few short years he has moved far and away from rag tag home run business and has built a more than competent and respected company especially considering they came about without the aid of Kickstarter; proving sometimes you really don’t need to rely on overselling yourself to get ahead as an entrepreneur. Most of these features we have come to expect for fully loaded printers, though a lot of the bells and whistles this product offers others charge a good bit more for. Makerbot is a good example of the runaway pricing you get from companies who find themselves extremely successful regardless of what they charge for their products.These features include their official support of exotic matierials like wood and stone filaments that use a bonding polymer similar to PLA and ABS. With options like this open to the public it’s easy to see why Makerbot has been falling far in favorability amongs people. Hopefully this will make the head way for better suited companies to fill the void of truly good enthusiast printing options. The Airwolf 3D HD does just this and comes in at just over $2,900 dollars and offering an almost fully enclosed and reliable printer. One of the only downsides to this printer is a lack of community surrounding it as it is a lesser known and talked about company, Airwolf 3D tries to outweigh this by offering their own extensive documentation and 24 hour support to call if you have any problems with your printer. While lacking in community, their products lack nothing in features. Airwolf offers a heated bed, OLED screen for navigating files from an SD card and configuring your printer, and a very large build area. While I can write all day about how a printer is awful or outstanding the middle ground is a much harder task, though this is often where the end consumer ends up. Choosing from one of the many ‘Good’ printers is far more difficult than you would think at a glance. All of them differ slightly and it is those slight differences that can mean having a great and reliable piece of equipment and having a temperamental but by all means still functional machine. You can compare this to many different industries, though for me the easiest parallel to draw is between 3D printing and building a computer. Factoring your budget exactly around what you want – holding back on some features and upgrades – and focusing on other parts with more money and attention, is key. Most people want a fast processor and high quality drives so their system will always run well from the get go, while some others only want as must graphical horsepower as possible and could not care less about the finer aspects of computing. I draw this comparison as a show of what many people run through their head with large purchases like this, “what can I get away with spending and still get what I’m looking for?” While many follow this as a guide, most of the time you have to bite the bullet on expense to ensure you’re not being shorted on quality just to save a hand full of dollars. Most of the time I’d advise really looking into the competition before making a choice, however the Airwolf does offer a lot of sought after features out of the box. With the widespread availability of different filament types supported out of the box, I’d almost recommend this for that feature alone. Of course, this is assuming that you personally need or want to work with a wide variety of materials. Airwolf 3D brought themselves even higher in my opinion by the add Control panel, stability and self contained nature of the device making it perfect for having on a desk as some other machines have part that move out of the footprint or have the reels for holding filament on the outside of the casing for the printer. Other solutions that have done this have made their machines require proprietary cartridges, which comes at a price and limits you to only one provider for filaments. I’d recommend this for anyone who needs a 3D printer that’s precise, reliable, and all round just a dream to use. Though it brings some slight drawbacks with their community being smaller than mainstream and highly advertised brands, they try to make up it with reliable 24 hour service staff. All in all this printer offers some of the best run of the mill features you’d want. If you know your way around a printer you’re sure to have no problem with this one. Even if you have very little knowledge on 3D printers this a pretty good place to start especially since most of the people who are starting out want to try everything they can and this printer offer that and more with the crazy filament variety including, metal, stone, wood and bamboo. 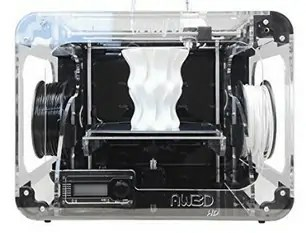 While a lot of these exotic filaments type are PLA or ABS based, this printer has been used with this materials and are guaranteed to work with the extruder design that Airwolf has made. Final Word: This is a solid machine for tinkering are trying new things (especially prototyping) that won’t hold you back when and if you turn your tinkering into a hobby or full time use, one of the solid options currently available. It’s really better for a tinkerer; however, and not so much for business or professional grade use. These are horrible printers, unreliable, pain to level, and the dual head is BS. The moment you run PC through one extruder, it cooks the other side and renders it useless. If it wasnt for the price i paid for this thing i would have thrown it off a bridge and maybe made some money back on the youtube hits.